Will Consumers Shell Out $150 for a Green Laptop Battery? "Graphics chip vendor Nvidia spent $43.6 million during its last fiscal year to cover warranty and product replacement claims related to graphics chips that were manufactured and sold with a weak packaging material, the company said on Friday. "In July 2008, Nvidia took a one-time $196 million charge against its second-quarter earnings to cover additional warranty and replacement costs related to faulty graphics chips, which the company said included a 'weak die/packaging material set.' Nvidia's financial year ended on January 25." "Netbooks are the in thing. The small and lightweight devices are scaled-down laptops that feature small processors and are ideal for tasks like email and surfing the web on the go. Everyone from Asus to HP and Dell has launched a mini laptop over the past two years. "However, one of the best things about netbooks is that it's cheap to buy one and take it for a test drive! So that's what I did. In December I bought an MSI Wind U100 . . . And then, to fully emulate the Mac netbook experience - because I'm not interested in a tiny laptop if it's running Windows - I installed Mac OS X on the thing." "The NPD Group has released the latest sales figures that reveal that laptop pricing for both Macs and PCs dropped during the month of February, with the average price of Mac laptops falling around seven%, with consumers paying $1,512. This is extremely low when compared to the average sales price of Windows based laptops which dropped twenty two% to an average price of $560. "Bring on the Apple MacBook Mini, or die a slow death, Apple." "As a dedicated reader of newspapers since I was 5 years old, it's really sad to see the downfall of this great American tradition. Print subscriptions are way down, ad revenue is drying up, and Americans are becoming more and more accustomed to the up-to-date news found on the Internet . . . Mike Simonton, an industry analyst, says 'In 2009 and 2010, all the two newspaper markets will become one-newspaper markets and you will start to see the one-newspaper markets become no-newspaper markets'. "...As if newspapers didn't have enough to worry about, now they are about to get hit by the Apple train. Reports that Apple is ordering 10-inch touchscreens have been confirmed by Dow Jones, The Wall Street Journal, and Reuters. Many are speculating that these will be used for Apple's new netbook but I think this device will be much different than what we're used to seeing in the netbook space. As Apple has done with the Mac, the iPod, and the iPhone, I expect it to revolutionize this sector of the market...."
"Don't worry, we're not about to bring you yet another hackintosh with a glowing Apple logo. This mod is altogether smarter and more elegant. 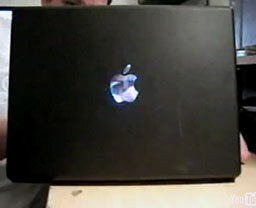 It's a real MacBook with another display within the Apple. "Eddie Zarick was actually responsible for the MSI Wind with a glowing logo we showed you last month. Since then, he's been busy opening up his black MacBook and wiring a second LCD behind the Apple. This is recognized as a proper secondary display by the Mac and can therefore show anything...."
"The unit has the Air's trademark curves, inlaid ports, notch at the front for lifting the lid and there's even an Apple logo - in a lawyer-beating 'flip horizontal' mode...."
Firmware update addresses flickering, compatibility issues. "The Mini DisplayPort to VGA Adapter firmware update will be downloaded to the Utilities folder and will automatically launch to update the firmware on the Mini DisplayPort to VGA Adapter. "The Mini DisplayPort to VGA Adapter must be plugged into your Mac and a compatible VGA display. The Mac power adapter must be plugged into a power outlet. "System Requirements: Mac OS X 10.5.6 or later. "Would you pay $150 for an energy-efficient battery for your laptop? In this economy? Hewlett Packard and Boston Power, a three-year-old startup that makes rechargeable lithium-ion batteries for laptops, are hoping you will, and this morning the companies have officially started selling the Enviro Series notebook battery for HP. "At $150 it's at the very high end of the laptop battery accessories that HP lists on its site. But for that price customers get a battery that lasts three years, runs for about four hours on a charge that fades less over time than comparable lithium-ion batteries...."
Link: Will Consumers Shell Out $150 for a Green Laptop Battery? "The unique features of OLED lighting are inspiring the imagination of designers. OLED lighting devices emit from the surface, can be made flexible/rollable, and even transparent like a window or reflective like a mirror. OLED lighting is thin, rugged, lightweight, and has fast switch-on times, wide operating temperatures, no noise and is environmentally friendly. The power efficiency of OLED lighting has also improved dramatically in recent years," said Jennifer Colegrove, Ph.D., Director of Display Technologies at DisplaySearch. "Hundreds of millions of dollars have been invested in OLED lighting, especially in Europe, the US, and Japan. Although OLED displays have been in mass production for about a decade, OLED lighting just started sampling and small volume production. This is due to the fact that OLED displays and OLED lighting face different challenges," added Dr. Colegrove. Market size, in both area (m2) and revenue ($) are forecast through 2018, with breakdowns for six applications, including automotive, display backlights, decorative/general lighting, healthcare/industrial, and signage/advertisement. Market forecasts are also given by substrate type, detailed by flexible versus rigid. Looking into the future, the OLED lighting industry will pick up in 2011, with Philips, GE, Konica Minolta, Lumiotec and OSRAM entering mass production (Figure 1). In OLED Lighting in 2009 and Beyond, DisplaySearch analyzes trends in the lighting industry and compares OLED lighting with five other lighting technologies: incandescent, fluorescent, high intensity discharge, LED and electroluminescent (EL). The report covers the OLED lighting supply chain, including more than 130 companies and universities, and analyzes several organizations related to OLED lighting in Europe, the US, Japan, Korea, Taiwan and China. The report also forecasts the efficiency, lifetime, and average selling price of OLED lighting devices. The OLED lighting and OLED display markets are compared and the market forecasts are analyzed. Business strategy recommendations are also given in the report. Finally, OLED lighting technologies, including structures, materials, efficiency improvement techniques, lifetime trends, and manufacturing (roll-to-roll vs. batch), are discussed and analyzed. OLED Lighting in 2009 and Beyond: The Bright Future is delivered in PowerPoint and Excel file. For more information, contact Carl Holec at +1.512.687.1505 or sales@displaysearch.com or contact your regional DisplaySearch office in China, Europe, Japan, Korea or Taiwan. 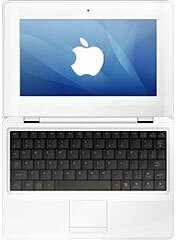 PR: QuickerTek's MacBook Air External Battery powers and charges the internal battery while you use the computer. You get 12 to 16 total hours of battery life - that's 6 to 10 extra hours of battery power. You know the QuickerTek External Battery is working because the battery charge%age in the menu bar stays at 100% for hours, before the power of internal battery is touched. While the stock Apple MacBook Air recharges in four hours using the AC wall adapter, the QuickerTek External Battery Charger recharges in only three hours. It's styled to blend in perfectly with all of your other cool Apple equipment. The MacBook Air External Battery Charger is lightweight, good looking and seriously powerful. PR: You love your laptop. But you're worried about how hot it gets. And you don't like hunching over to use it. Logitech today introduced the Logitech Cooling Pad N100 and the Logitech Notebook Riser N110, which extend the company's line of notebook essentials that help make the laptop experience more comfortable around the home. While the laptop is now the form factor of choice for around-the-home computing, Logitech research revealed that many people who feel that what they gain in convenience, they lose in comfort. For example, more than 60% of people surveyed reported using their laptops on the couch. However, more than 50% of them are concerned about laptop heat and 43% believe that excessive laptop heat can slow, or damage, their computer. Among people who prefer a more structured computing environment, more than 64% use their laptop on a desk, but 41% report concerns about how this affects their posture. 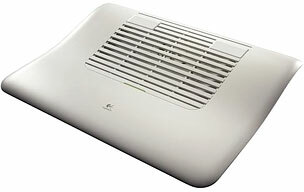 The Logitech Cooling Pad N100 is expected to be available in the US in March and Europe in April for a suggested retail price of $29.99. 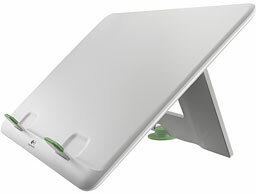 The Logitech Notebook Riser N110 is expected to be available in the US in May for a suggested retail price of $29.99. The Logitech Comfort Lapdesk for Notebooks is available now in the US and Europe for a suggested retail price of $39.99. PR: DeskStanz Notebook Standz let you stand your Apple notebook upright to free up valuable desk space when working with an external monitor. This effectively turns your Apple notebook into a sleek space-saving desktop CPU. Just put your MacBook or MacBook Pro into sleep mode by shutting the lid, insert into the stand and connect your monitor, keyboard, and mouse. You can then wake your computer using the attached external keyboard, as easy as that. Solid construction holds notebook incredibly securely. Easy access to all ports and disk drive. Lower notebook temperature due to better airflow. Soft inserts protect your notebook from scratches. 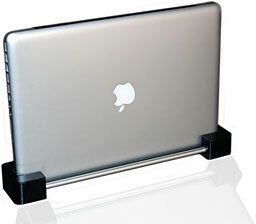 The Deskstandz Laptop Stand is designed to be small and compact yet deliver great features. Its solid plastic and aluminum construction give it a high quality and solid feel. The stand elevates your laptop to allow for better airflow and cooling, whilst also giving you a more comfortable typing angle. Soft rubber pads provide grip on most surfaces and protection for wooden desks and other delicate surfaces. These stands are perfect use in homes and offices but can also be used whilst traveling. 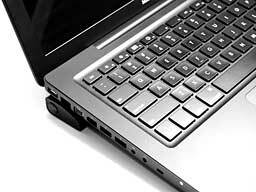 Because all laptops are not designed the same, and the underside is not always smooth, the middle of the three feet can slide from side to side to allow for differences in the underside of laptops. 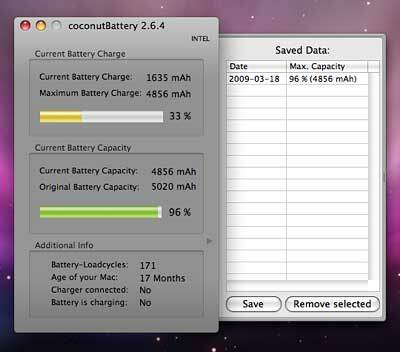 PR: coconutBattery is a tool that reads out the data of your notebook-battery (iBook/PowerBook). It gives you live feedback, what's going on in your battery (not only a snapshot like other tools). coconutBattery isn't just a tool which shows you only the current charge of your battery - it also shows you the current maximum capacity of it in relation to the original capacity your battery had as it left the factory. You also get information about the battery load cycles (how often did you fully load your battery), the current charger (coconutBattery even warns you if you plugged in a wrong charger for your Notebook) and last but not least information about the age of your Mac. coconutBattery gives you all these information just in time because of it's live-feedback interface! Of course you are able to save the current maximum capacity of your battery - with just one click! coconutBattery uses Apple's new and really powerful technology named "CoreData" to realize this comfortable saving option. The hottest battery information app out there got even hotter!!! A good selection of old-school MacBooks this week, plus a full slate of refurb Unibodies,save for the 17-incher.